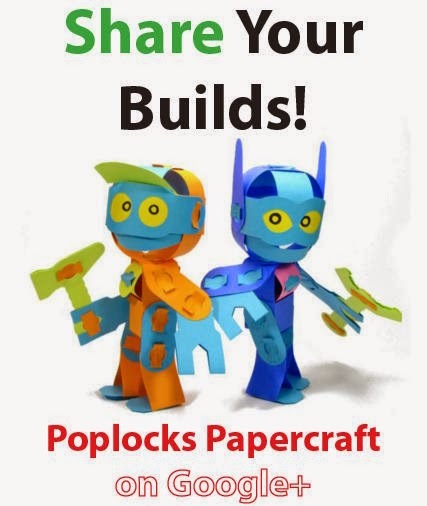 Paper Poseables: Poplock Freebie - X-PLR and BLOCK RACER! I am very excited about this latest "Freebie" release! The Block Racer is my first PopLocks vehicle and I managed to fit all of it and a Face Block driver (X-PLR or "Explore") onto one sheet of card stock! As you can see above, the racer vehicle looks very nice when two or more colors are used. Print on colored card stock, 65lb. or heavier for the best results! One other thing to note - the Poplocks on this sheet are slimmer, but they still work just as great as the wider-flapped version. Slim Poplocks allow more, larger parts to fit on the page! Click "Read More" to grab this PDF from the Download Link and also see what's up when Face Blocks get their race on! in half and in half again. Read more about how Poplocks work! while you overlap the bottom panels. Use a Poplock to seal the bottom panels of the cube. Leave the side holes empty. in half and in half again. Fold the Racer Bottom to look like this. and attach them to the Racer Top with a Poplock in each hole. Pop your driver in the cockpit! And start your SCRAM jets! "I'm so far ahead, I'm the only one in this picture!" "Oh man, that was a good race! The turbo is making a funny noise though"
"R-MZ will take a look at that turbo for you, no problem!" "R-MZ! Those claws will create too much drag! Ditch 'em and we can race!" Waaah! I love the fun foam bot on your blog! I made these whales 15 years ago, but I only had an xacto knife and I got fed up with how hard it is to make a clean and precise cut! amazing Josh! beautifully simple design, with a fabulous fun outcome !